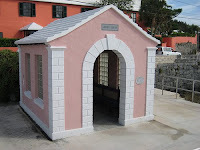 Paget Parish is located almost in the middle of the island and width ways stretches from the south shore to Hamilton Harbour and like all Bermuda's Parishes it covers 2.3 square miles or about 1500 acres. As explained yesterday each Parish is named for Elizabethan aristrocats, Paget is named after Elizabethan patron, English peer and colonist William Paget, (1572-1629), the 4th Baron Paget de Beaudesert, born in Beaudesert, Warwickshire. He is buried at West Drayton in Middlesex. Sandwiched between water Paget has many natural features including the harbour which is followed by the narrow and winding Harbour Road, the road on which we live and frankly a bit of a death trap. Just down the street from us is the Salt Kettle peninsula, which is a g reat source of beautiful peaceful walks. It is also home to a couple of tidy looking guest houses and has it's own ferry stop. Harbour Road heading east will take you into Hamilton but on the left before the Crow Lane roundabout is the countries National Trust headquarters at Waterville. Built before 1735, Waterville is one of the oldest houses on Bermuda. It was home to seven generations of the prominent Trimingham family of department store fame, although sadly two years ago their flagship store on Front Street went inexplicably bust. Admission to the house is free and it contains many family heirlooms. The Bermuda Rose Society is also based here. At this point of the island sports enthusiasts can play tennis at the Pomander Gate Tennis Club, but you will need to know a member or for sailors, the world's only desiginated 'Royal' Dinghy Club is situated at Mangroville as it has been since 1882. Again you will need to know a member to visit. No membership required for Paget Marsh Nature Reserve but as I found out the reserve is not a day trip, or even a half day unless you are expecting to sit and read a novel. Nonetheless it is about 25 acres of unspoilt marshland and delightful palmetto and cedar trees. A twisting wooden boardwalk (left) runs through it and the area is, if you are that way inclined, ecologically and ornithologically interesting. 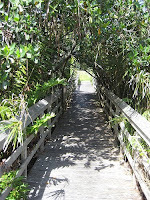 Less known is the Hungry Bay Nature Reserve, described as a mini Florida Everglades. I'm not sure, the swamps are one for the adventurous but cliff walks will open your eyes to some charming coastline and the old ruin of Hungry Bay Fort. The biggest tourist attraction in Paget is the Botanical Gardens. A beautifully maintained and manicured park with collections of hibiscus and banyan trees. There is also an aviary, Japanese Zen Garden, a 17th century style English Parterre Garden, a 12th Century style Persian Garden, and a Tudor style Children's Maze Garden. 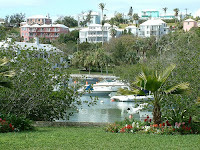 The garden also incorporates Camden House, the Bermuda's Premier official home, although he doesn't actually live here. You can take the organised tour or just mosey around yourself but it is a very pretty spot. In peak season a cafe sells soup, sandwiches and drinks. 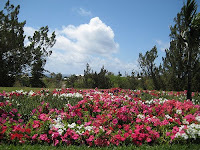 Within the Botanical Gardens is also Bermuda's first purpose built art museum called Masterworks. Created thanks to the efforts of local philanthropist Tom Butterfield, Masterworks opened in 2008 and hosts a wide variety of shows and events. If you are an art fiend, the Birdsey Studio is also nearby. Near the Botanical Gardens is the island's only hospital, King Edward VII - a short run from our house, very handy in our current pregnant state and the various facilities employ 1,500 people. The hospital is no hotel, believe me but one of the island's most celebrated hotels is in Paget at Elbow Beach. Still in need of a lot of upgrades to bring it up to the Mandarin Oriental standard, for which it's a part of, it's still more than decent and occupies an alluring beach-front position on the south shore. Elbow is also home to the Parishes best restaurant's. Lido is only open in the winter months and is a bit businessey but Sea Breeze out on the terrace is more casual. In the hotel itself I thoroughly recommend the food at the Seahorse Grill and then most popular of all of Elbow's eating establishments, Mickey's on the beach where the setting more than makes up for the average food. For a more traditional restaurant experience venture to Fourways Inn on Middle Road. Further along the beach from Elbow is the fast becoming run down Coral Beach Club, slated to become a Four Seasons hotel but only a reality if finance, planning and disagreements over employment can be succumbed. The Horizons cottage colony across South Road makes up part of the development, which is still in use as is the golf course and the impeccibly set Splendido restaurant. The other hotel in Paget is Newstead occupying a prime view over the Great Sound. 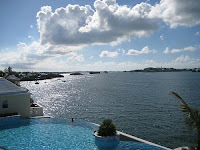 Recently renovated the property includes a spa, tennis courts, an infinity pool (left) and the Beau Rivage restaurant. It has a deal with Belmont Golf Club and an in-house water shuttle whisks guests across the harbour. Friday night happy hour by the pool has become very popular this summer although not for me as I haven't made it down the road. 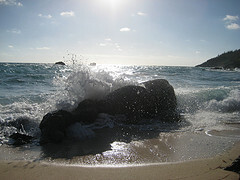 One of the Parishes nicest beaches is at Grape Bay off South Road. The US Consul General has a huge house here and holds an annual July 4th firework display. Near here on Middle Road is Paget Plaza, somewhat overstating a small string of shops including a Pharmacy and a late night burger place. Avoid the wahoo nuggets, I don't know which part of a wahoo they use, but it isn't fillet. A little further up Middle Road is Paget Post Office, possibly the smallest post office in the world. Back across the Parish to the harbour, seven islands form part of Paget including Burnt Island, which we can see from our house and Hinson's Island. Hinson's has had an exciting history for a dot on the landscape. Once a Boer War prisoner of war camp and also the first air base for aircraft in Bermuda, it is now an exclusive residential island (pop: 50) only reachable b y ferry. The ferry service is excellent and how I normally commute to work. Salt Kettle, Hodson's and Lower Ferry (right) all have stops along the Paget side of the Great Sound and the 'pink route' ferry makes for a marvellous visitors tour of the harbour as well.